Malchas picked us up the next morning for our final trip. We were going to Svaneti, but first we’d be visiting Georgia’s second largest city, Kutaisi. Bagrati under wraps - no admittance! Initially, we had planned on spending a night in Kutaisi, but our plans changed and we would just be passing through, taking in some of the major sites. We arrived at lunch time and Malchas took us to a restaurant that he had eaten at before. The problem was that he went to smoke while we went in. Almost immediately, we could see that the menu was only in Georgian and nobody understood a word of English – we hardly sat down before we were up again and out – we are not the kind of family that will point to a menu and hope for the best without having the slightest idea of what we had just ordered. Malchas didn’t want to join us at our meal – I am sure he felt out of place, so we couldn’t invite him in to translate for us. We found a little grocery store and bought some drinks and snacks that made a very makeshift lunch. We were in Kutaisi mainly to see some of its religious buildings. The modern part of the city (if you can call it that) appeared to be extremely unattractive – lots of traffic, no real shops to speak of, we couldn’t even find anywhere to go to the bathroom. Driving into the older part of town, it was clear that it had far more character, but like so many Georgian towns, it also looked like it was falling apart at the seams. 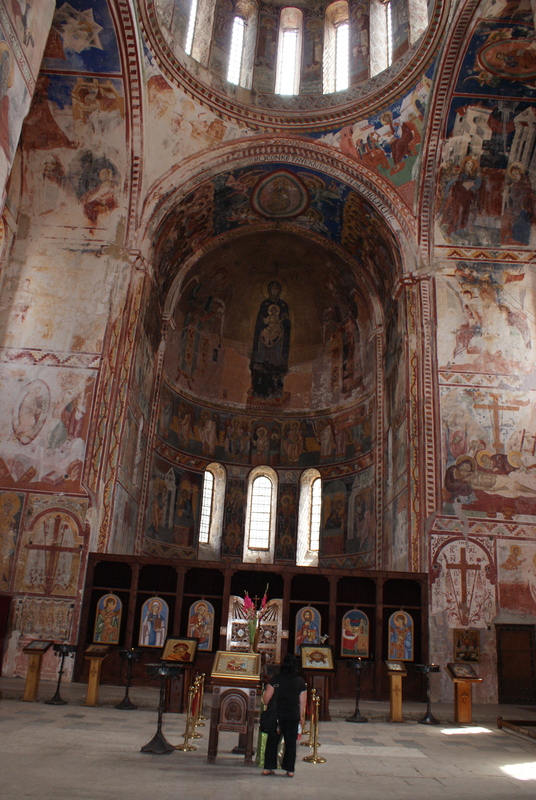 We headed for the Bagrati Cathedral – a UNESCO World Heritage Site – a huge building dating to the 11th century. The Turks had blown it up and so it had stood as an immense ruin for 350 years – UNTIL we arrived. 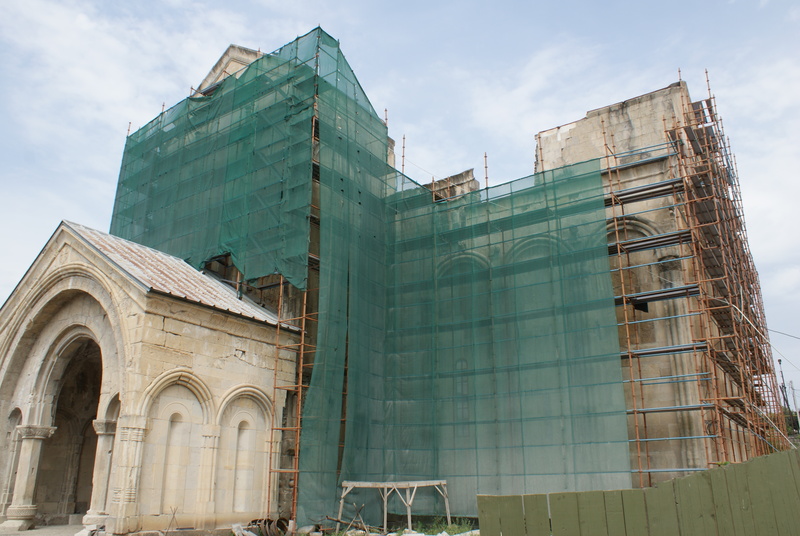 Very recently , Georgia has embarked on a huge ambitious project to rebuild Bagrati, and so, today, it’ covered in scaffolding and one isn’t allowed inside. My guess is that it will stay this way for many years. Synagogue, Kutaisi - with a very unusual double ark. 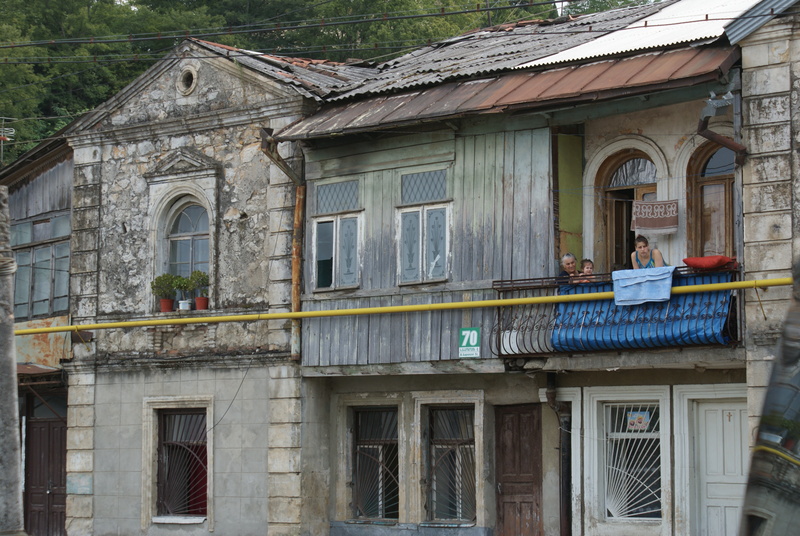 I then asked Malchas to take us to the old Jewish quarter – Kutaisi once had the largest Jewish population in Georgia, though almost all have left for greener pastures (Israel and beyond). 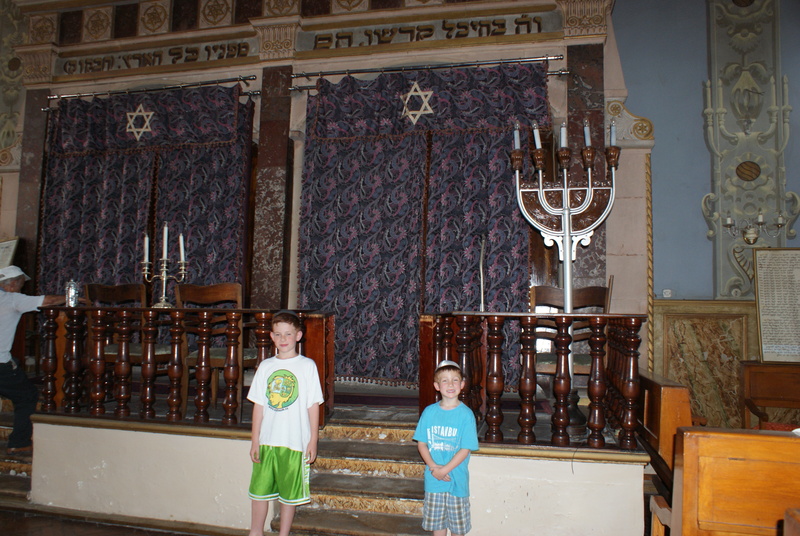 We drove into a very atmospheric area and some locals pointed out a synagogue that was locked. 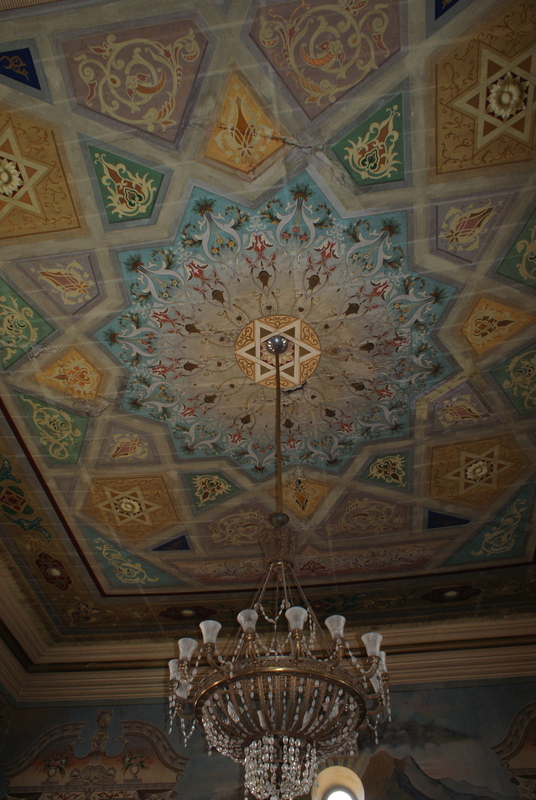 Driving on, we found one that actually had a caretaker, and he was happy to show us around not only one but two synagogues. They were really beautiful, and were in fine shape. Someone is making a big effort to look after them. From there we drove out of town to the Gelati cathedral . A huge and ancient (dating to 1106) building, Gelati holds a very important place in Georgia, with many kings buried there and where the current president chose to be inaugurated. 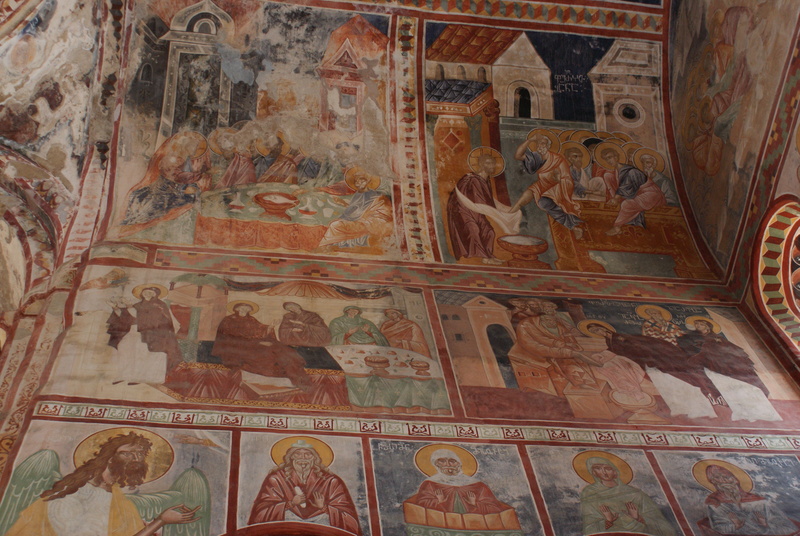 It was very impressive with incredible frescoes all around. It was time to leave Kutaisi and to push on. PS: These days I help plan great itineraries for families. Click here for more info. « Tbilisi with Kids: kids’ stuff, a great museum and some of the best Thai food we have eaten!